DE Docent: 07/05/2010 (Monday) - More on 3"
There seemed to be plenty of guides on 4th, so I worked on Monday 5th instead. Seemed pretty slow, I gave one tour and went home early. It appears that everyone is stumped with the power button setting (fast/slow ) for the 3" Mark 31 Elevation Power Drive (Follow-up on my June Entry). Tim sent out e-mails to different experts throughout the historical fleet. 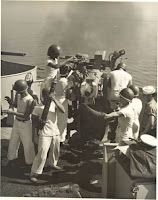 During the inquiry we were sent this neat photo of a 3" gun being fired. The photo caught the 3" empty case being ejected. You can see the loader ready to ram another round, while the hot shell man (with his protective glove) tries to catch the hot empty. 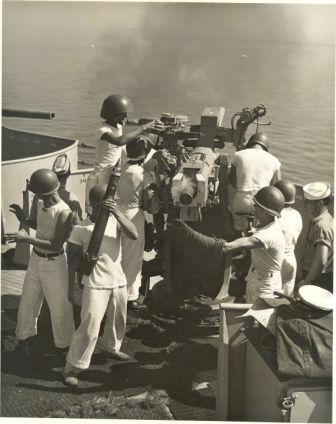 Since some of the sailors are in whites (probably trainees) and others are in dungarees (probably trainers) we think that the photo is from a training exercise perhaps on the USS Wyoming (BB-32). One of our volunteers, Master Chief Floyd (since retired) served on the Wyoming in 1943. ".... The extent of her operations can be seen from a random sampling of figures; in November, Wyoming trained 133 officers and 1,329 men in antiaircraft gunnery. During that month, she fired 3,033 5 in (130 mm) shells, 849 3 in (76 mm); 10,076 40 mm; 32,231 20 mm; 66,270 .30 in (7.62 mm); and 360 1.1 in (27 mm) ammunition. She claimed the distinction of firing off more ammunition that any other ship in the fleet, training an estimated 35,000 gunners on some seven different types of guns. 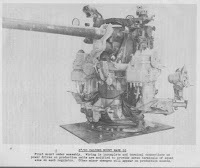 ..."
The Mark 31 power drive was the 1st attempt to link 3" 50 cal to director control. This upgrade resulted changed the Mark # to 26. This was not a major mark and it's very hard to find documentation about the upgrade. The best document to date is an Ordnance Bulletin 1-1946. The bulletin notes that the upgrades started after August 1945, after the USS Slater deployed to the Pacific. Our theory is that the upgrade may have occurred when the USS Slater was transferred to the Greek Navy. The bulletin does not mention the dual setting of the elevation power button. 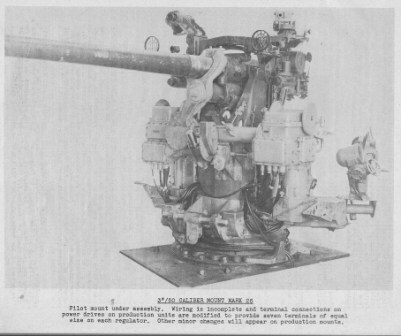 However, there is no doubt the USS Slater is equipped with Mark 26 Mounts. Expect more on this issue in subsequent posts.